Highlights: Friends, this is the next big thing on Broadway. I saw a preview, but the crowd was already super into it like they've been waiting for it their whole lives. I've been waiting for it since 2010, which I saw Anais perform at Storyhill Fest in central Minnesota. It's thrilling to see this album I've been listening to expanded into the complete story in a fully populated world. As they say in the show, it's a sad old song, but they sing it anyway. A song of hope and dreaming for a better world, in which the poet/songwriter Orpheus and the hungry drifter Eurydice fall in love and try to make a life for themselves, until poverty and Hades get in the way. This ancient myth feels relevant with its themes of people in poverty striving for a better life, workers uniting, a greedy despot who builds a wall to keep out the enemy. The jazz-infused folk score is pretty genius, performed by an awesome seven-piece onstage band that feels like part of the story (introduced by name during the show!). The set (concentric moving circles, with the center circle falling below the stage and rising up like a pedestal), costume (modern grungy chic), and lighting (swinging lamps!) design are incredible and stunning, creating this sort of sepia-toned steampunk look with startling moments of revelation. 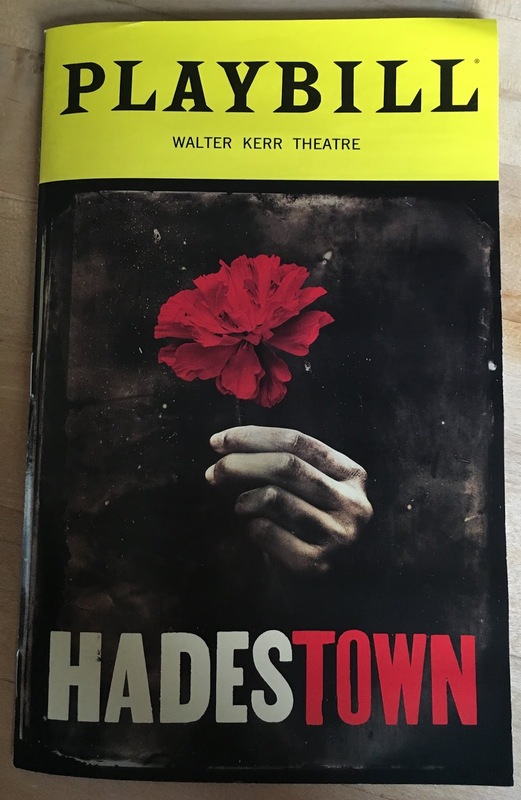 A gorgeous, talented, and diverse 13-person cast creates this whole world, all introduced by the narrator Hermes (the divine legend Andre De Shields) in the opening song. 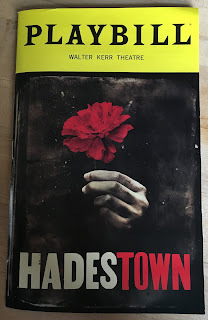 Reeve Carney sings like an angel as the poet Orpheus, Eva Noblezada sounds gorgeous singing Anais' songs and imbues Eurydice with strength and determination. Amber Gray is a shoo-in for a Tony nom for her gutsy and guttural performance as Persephone, queen of the underworld. As Hades, Patrick Page is a suave pin-striped suit and steel-toed boots wearing devil with a voice as deep as hell itself. Three amazing harmony singing Fates, and the five-person hardest working chorus on Broadway complete the world, with most of the actors staying on stage for most of the show.